Located on the bank of Gia River, the Song Gia Resort Complex is 100km from Hanoi – the Vietnam’s capital, 13km from Hai Phong. The newly constructed expressway linking Ha Noi and the northern port city of Hai Phong helps shorten the travel time to 1.5 hours by car. From here, guests can enjoy easy access to all that the lively city has to offer and other northern famous tourist attractions such as Ha Long Bay – the World Natural Heritage Site and Cat Ba Island – the northern Vietnam’s adventure sport and ecotourism hub. 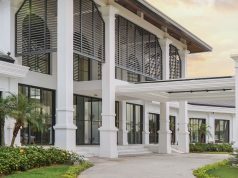 The complex boasts first-class “valet service” and top-rated equipment satisfied all demands, including golf, resort, sport, entertainment, residence, business, art and culture that will beautify guests’ colorful life. 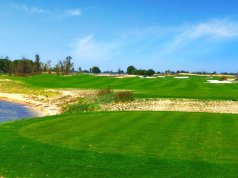 The course is surrounded by the ecological natural environment of the natural recreation forest where Song Gia and Song Mok join to become one river, the stunning design is a truly masterpiece providing the best services and high class facilities. With beautiful natural landscapes and appreciate physical activities, guests will overflow with unforgettable golfing experience, relaxing moments at Hyundai Song Gia Golf and Country Club and prepare for tomorrow with full of life energy. 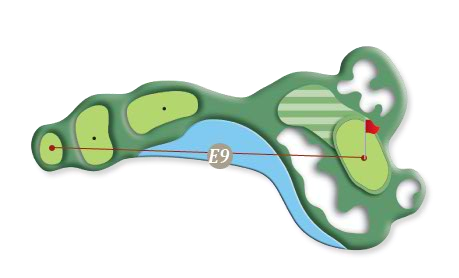 The 27-hole international standard course is divided into 18-hole par-71 membership course consisting of River Nine and Ocean Nine; and the 9-hole executive course: the Hill Nine. Enjoy playing golf where you can see the wonderful distant view of Gia River and the refreshment from the beautiful lakes on the left side. 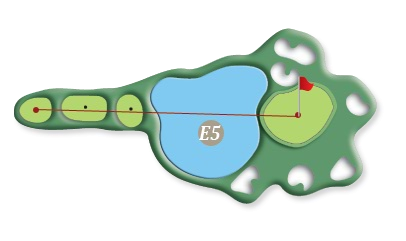 Hole 5th 515m par 5 with a large water hazard providing the most beautiful scene, bogie players better try 3 on by sending to 21P on the right side where green is open. Hole 7th 342m is the very tough par four, it is called as dancing bunker because there are a lot of bunkers sitting close to one another show the most challenging hole in the river course. “Pleasant Start” ! Hole1 is where you can see the distant view of Song Gia and the refreshment from the lake on the left side. Please enjoy the clean shot which relieves your stress. “Walking on the water” . Stand from this hole to see Song Gia Golf Resort as a picture, you can enjoy the beauty of the river in front your eyes. Please hit the thrilling tee shot towards the bunkers. “Conquer” !It is a difficult par3 course where you have to cross Water hazard and Waste area. Please try to approach by hitting ball slightlyon the right hand side to avoid Water hazard. “Beautiful journey of life”! It is a par 4 hole. For the first shot, you hit ball slightly on the right side to avoid Water hazard. And for second shot, please hit it exquisitely on the gentleslope of golf course. “Stunning like picture”! Par 4 Hole with a large Water hazard surround which is considered one of the most beautiful scene. “Pleasure being together”!It is a par3 Hole where there is Water Hazard on the right side. For amateurs, it is recommended to use 1 driver club. “The most beautiful dancing bunker”!It is called as dancing bunker because there are a lot of bunkers in this hole. Bunkers situate close to each another make the course more challenging and beautiful. “Feeling of time passing”! As the longest par4 Hole, please hit your longest shot with wideswing for long distance. Mind the bunkers of both sides. You need to hit first shot the ballnot fall in the bunker in the right side and the second shot not fall in bunker in the left side of green. “Festival white sandy”! This hole makes you feel like walking along white sandy beach. It is challenging hole,the hazards thrill you. This hole attracts youfrom first shot until the end. An attraction of this course is to go for a walk by the Moc river. You will have the most authentic feel about this sport. Hole 11th 410m par 4 is regarded as God’s Walking as you can hit looking at the lake and distant Song Gia. It makes you feel like you are effortlessly floating on the surface of the water . “Nature smile”! This first hole of Ocean Course creates comfort feeling of first shot toward broad fairway in front of your eyes. “Exciting wandering”! The Green of Hole 11 is towards the river. Golfers experience the “putting on the water” and the most beautiful line of golf swing with this hole. “Wonderland”! It is poetic scenery. The right hand side is aquatic plants. The left hand side is water hazards. Mind the direction and distance for golfing in this hole. “Beautiful life”! You can see the gorgeous picture of harmony between aquatic plants with flowers around teeing. And bunkers are cross the wide green fairway make your game attractive. Knot is untied” This par is where Gia and Moc River meet. Conquer this hole by powerful swing and remember to avoid bunkers on your right hand side. “Choir”! The blending of reeds, creeks and wind is typical view of this hole. This hole is close to Moc River with reeds along the creek, the scene of this hole looks like untamed place. “Power of harmony” !This is par 4 hole with long distance and huge fairway. The lake in between fairway and teeing with vertical bunkers on left hand beautify this hole. Try your best with a power swing! “Enchanting” ! This is par 3 hole with river along left side and white sand embrace the green area. Stand on your right hand side and make one beautiful shot on the green. “Champion feeling”! It is challenging hole since bunkers are all located in front the green and water hazards cross between. Be careful with water hazards and all bunkers! Skillful golfers will show in this hole. The perfect balance between fun and challenge in a splendid environment is adjusted to maximize the attractiveness and thrilling excitement to each game. Hole E4 215m which is the longest par 3 hole is also one of the most challenging holes you’ll ever play because of the danger. If you’re short, you’re in the water or the bunker right in front of the green and if you go over, you’re in the another bunker, you can be successful with the wise shot from real maches. Hole E8 340m par 4 is the beautiful hole where you have to hit crossing the lake and bunker. It’s important to keep accurate notes on your shots and their distances. Competition of accurate! As the first hole of Executive hole, it is for testing the accuracy of long iron. Becareful with long bunker in front of your eyes! Play a determined shot in this hole! It is the longest par 3 hole. However, you can be successful with the wise shot! Straight direction of your shot towards green in front of your eyes but mind the water hazard in the middle. Play with a calmed mind!It is good to hit directly over the bunkers of the both sides of green. The beautiful hole where you have to hit crossing the lake and bunker. This hole is to test your capability of golf swing. Happiness of no matter what the result is! As the last hole of Executive hole so you have to do your best! Keyword: hyundai song gia golf, hyundai song gia golf club, hyundai song gia country, hyundai song gia golf country club.